It’s hard to believe that we have been using the V2 platform for so long now! In addition to all the exciting features of V2, we have been rocking the landing pages, as well. This dynamic tool gives advisors the unique opportunity to promote themselves and their unique offerings. 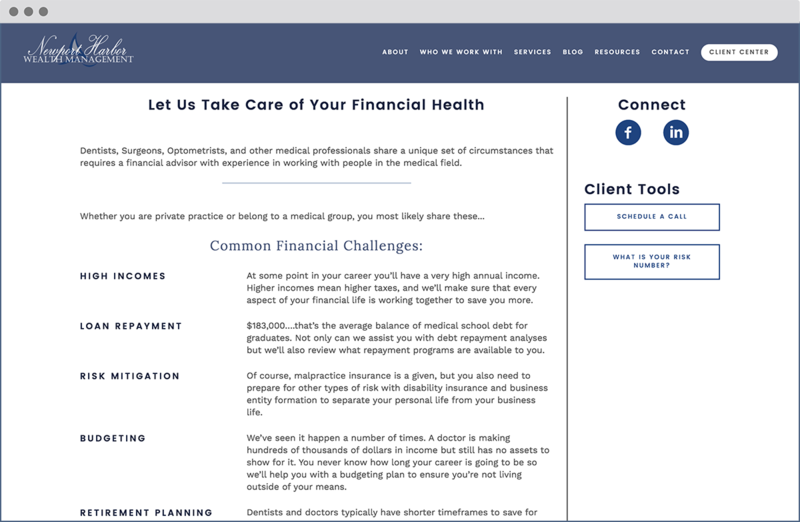 Advisors now have the ability to create one-off pages that effectively advertise services, connect with niche markets, drive lead generation, and further engage current clients. As if the quote below from a study done by Omniture isn’t enough to convince you, then continue reading to find out more! Utilizing a Landing to Target Your Campaign Traffic Increases Conversion Rates by 25%. Check out a few examples and ideas below on how you can use this amazing feature, that also just happens to be FREE! All of our landing pages work with the same tools and easy-to-use interface within our app. You can easily add pages of any type, such as standard pages, blog pages, or team member pages, to get started. Simply drag, drop, click, and type to customize your landing pages and forms, and the good news is that there are no tech skills required to do this. You can very easily upload eBooks, PDFs, videos, forms, and more. Landing pages are made for niche marketing, with the ability to tailor pages to specific niches you target. 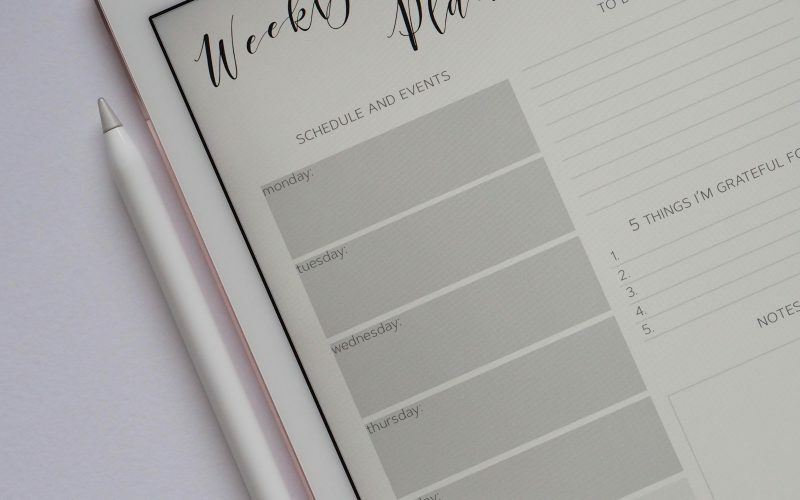 If you have read some of our other blogs, then you know that we find niche marketing so important, which is why we love using landing pages because you can really target an audience and be very specific about your focus! You can now easily promote upcoming events, eBooks, whitepapers and other timely offerings to your site visitors. Again, it’s simple to create your landing pages by just clicking and typing, so this specific page should take no time at all. 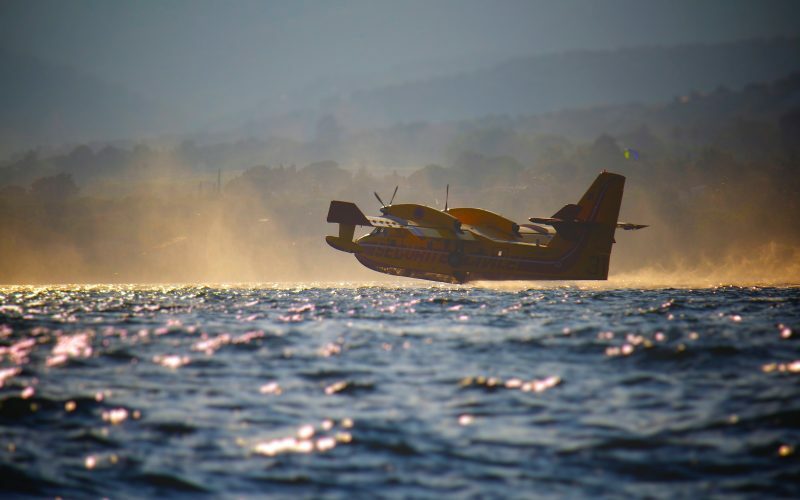 Once your new landing pages are setup it’s time to promote! Each page comes with its own unique URL, so grab that URL, which is your domain and the URL slug, and share via your social media channels and/or email lists to exponentially increase your reach! 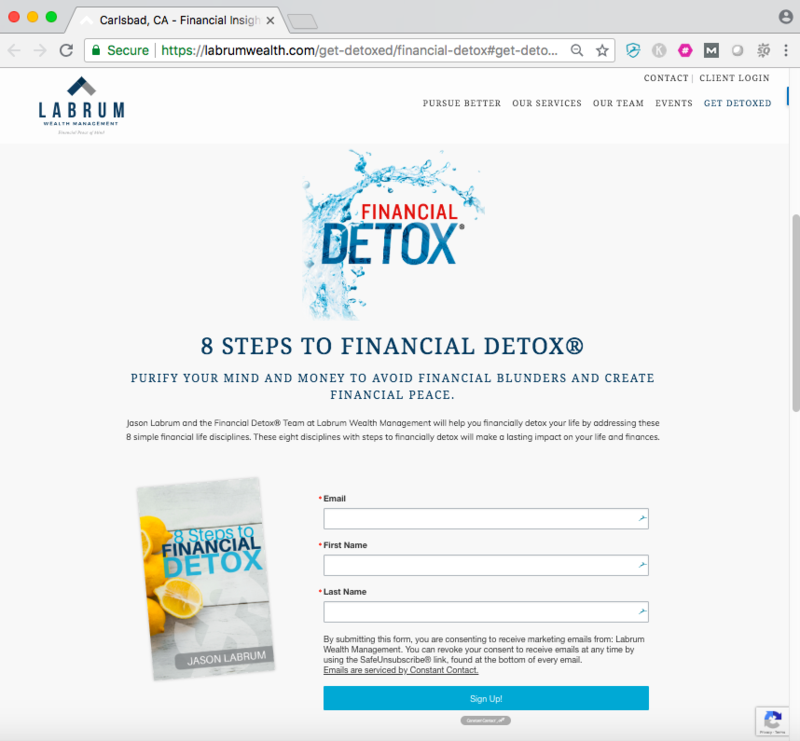 In the above image from Twenty Over Ten client, Labrum Wealth Management, they are promoting an eBook called, “8 Steps to Financial Detox,” which is free if you just enter your name and email! 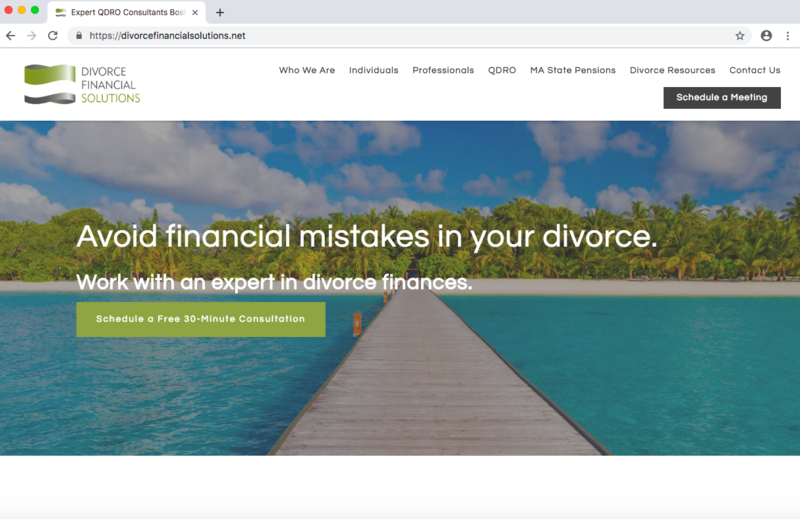 With the eye-catching picture of the book and a quick route to financial peace of mind, Labrum Wealth does a good job of drawing in visitors with a no-nonsense form to fill out for something FREE that will ultimately help you. Basically, lead generation is in the process where you attract and convert visitors into becoming prospects who may eventually become clients that are interested in the services that your advisory firm is selling. A positive side effect of landing pages is their power to generate leads. 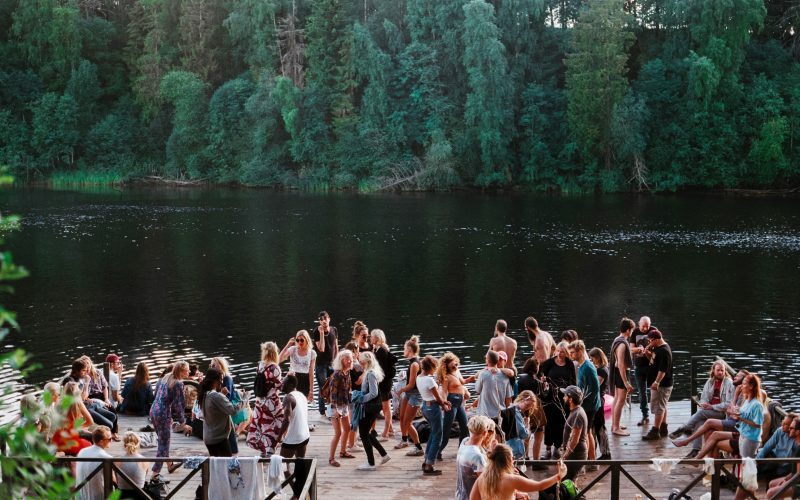 Whether you are using your landing page to connect with a specific niche or promote an upcoming event, then you will obviously want to use a simple and efficient way to get their contact information. This can be done by simply adding a form to your landing page to capture information from potential leads on the way to making your new landing page a high-conversion one. 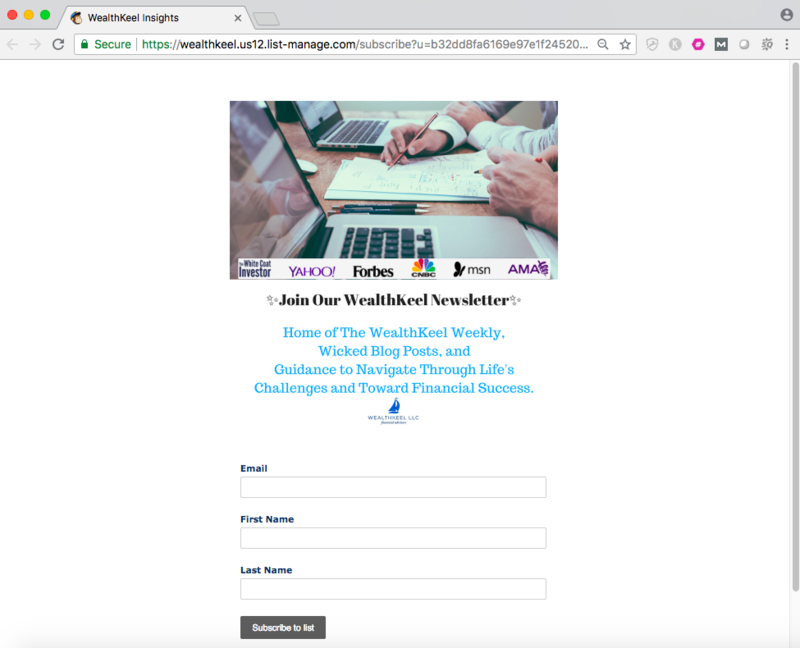 In the above image, Twenty Over Ten client, WealthKeel LLC, has a simple page and only asks for the visitor’s email address, first name and last name in order to subscribe to their mailing list. People are busy, so making sure that you keep the form short and sweet is key, because nobody wants to take too much time in order to fill out a long form field, and this is all that you should really need to contact them anyways! Marketing your new financial planning business is pertinent to the success of your new practice and it all starts with your online presence. From building websites to social media, Google Analytics and SEO we’re here to help!